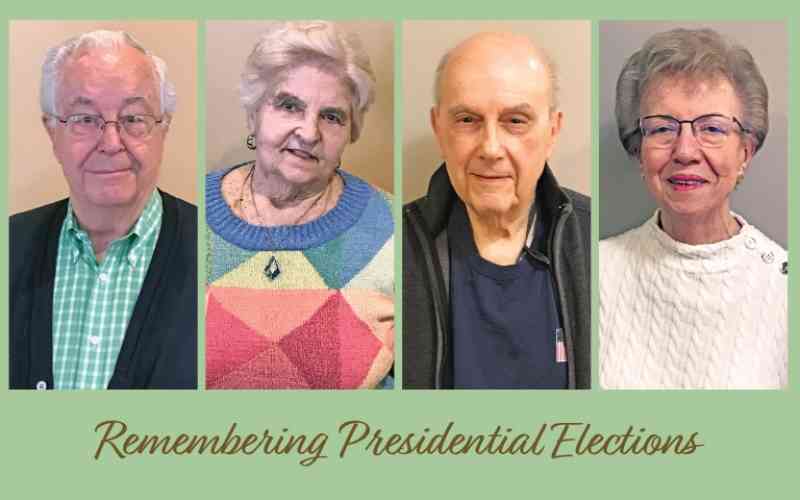 As President’s Day approached, roving reporter David Culver asked Plush Mills residents to reflect on the first time they voted for President of the United States. Ken Wright – The first time I voted for president I voted for Dwight Eisenhower, but I hardly remember it. I was just getting out of high school and I was looking to get into college at Denison University. I had a girlfriend, who would become my wife between my junior and senior years. So, other things seemed more important. I admired Eisenhower, and I’d like to be able to say that’s why I voted for him. But I really voted for him because my father always voted Republican. Later on, I switched to the Democratic Party, and politics – and voting – continued to be very important to me. It was a very different time back in the 1950s. Everyone was terrified of communism – and the atom bomb, too. In school, we were trained how to duck under our desks if a bomb was dropped. It was a significantly worrisome time. When I was old enough, I volunteered for ROTC and the Air Force as a navigator/bombardier. I feel strongly that everyone – men and women – should serve their country in some way. I never fought in a war, but that was a very scary time. One other thing was different about those days: The media protected the president back then. You didn’t know a lot of what the president did. Today you know everything. I’m not sure that’s better, but it certainly is different. Margot Francisco – I was very excited about voting in the presidential election for the first time because I had just taken the oath to become a U.S. citizen in San Bernardino, Calif. I had grown up in Munich, Germany, moved to the United States in 1962 and got married in 1964 and moved to where my husband was stationed in the Mohave Desert. I had grown up in Germany, so California was very different for me. We moved east and lived in several southeastern Philadelphia area towns including Media and Secane and in Cape May, N.J.
My husband’s and my first U.S. home was in Secane, Pa. Why Secane? No fences around the yards. In Europe, every house had a fence around it, and it represented to me poverty. In Secane and everywhere else we looked there were houses with no fences. It was like in the movies. Dominic Masciantonio – In the late 1940s, America was booming. World War II had ended and the Korean War hadn’t started yet. The Cold War with the Soviet Union was in its early stages. But what I remember is that things were really busy. Soldiers were home from the war. Veterans became known as the 52-20 club because most of them received $20 a week for 52 weeks to allow them to adjust to civilian life again. New cars were coming out for the first time, and I bought a new 1953 Chevrolet. Things were good. In 1948, I was in the Coast Guard, but had a serious fall on a ship and, as a result, had to leave the program. I got married and went back to school at University of Pennsylvania and St. Joseph’s and got a law degree. In a St. Joe’s Constitutional Law class, I wrote a scathing paper about Franklin Roosevelt. My professor said the paper was very well thought out, but he told me, “This isn’t a real article. You’re too involved with the subject.” I guess he could see I wasn’t a fan of Roosevelt. In fact, the first time I voted for president was for Republican Thomas E. Dewey in 1948. I was a follower. My dad was deeply into Republican politics. He was a court officer and a ward leader. If I’d voted for Truman, my dad would have had a fit. Roseann Rackie – The first election in which I participated was in 1956. I grew up during World War II, and I knew about Dwight Eisenhower. He was so popular and so well loved. He was a war hero and he ended the Korean War during his first term as president. I liked him, and I voted for him for his second term. My father was very interested in politics. He knew that my first opportunity to vote was coming up, so he encouraged me to ask him a lot of questions. My brother ran for a state Senate seat, too. I guess we were all interested in politics. I recall that Eisenhower almost didn’t run for a second term because of a 1955 heart attack. And, Vice President Nixon was nearly taken off the ticket for the second term because of a so-called scandal. It was discovered he had a political fund, and some thought that might open him up to a conflict of interest. That’s when he went on TV and gave the famous Checkers speech and stayed on the ticket. I considered myself a Republican at the time, but I liked John Kennedy, and I voted for him. I liked the fact that he wasn’t primarily known for his military service. He was young and vital and had a young family. I think he connected with people more.